Gaskets are part of an engine that most vehicle owners do not anticipate having to replace. Of course, the need for gasket replacement depends on how long the vehicle has been in use and its past history. The purpose of a gasket is to seal engine components and prevent leaks. Engine leaks are one of the worst problems a vehicle can have, which reinforces the importance of functional gaskets. Typically, a gasket will not begin malfunctioning until a vehicle has reached at least 60,000 miles. In order to tell when a gasket needs to be replaced, there are a few warning signs. Coolant leaks are a common sign that a gasket may need replacing, but there are other causes for coolant leaks like, a leaky radiator cap, a hole in the radiator, or a water pump leak. This type of leak would usually require the replacement of the manifold gaskets that are used to attach the intake manifold cover to the top of the engine. While replacing manifold gaskets can be temporarily delayed, a failing head gasket must be addressed immediately. Most head gasket failures are caused by problems in either operation, installation, or design. As long as the ignition timing is correct and the cooling system works, there should be no operational problems. Using the correct gasket material will prevent major design issues. But with installation, there is more to account for. To prevent future head gasket problems, special precautions can be taken with installation, like cleaning the deck surface to make sure leftover debris does not prevent the new gasket from adhering. Inspecting the head bolts and using new bolts will ensure that they are the proper size and do not have any existing damage. Proper handling of the gasket is essential to making sure its potential for full function is not compromised during the repair process. For many repairs, it is easier and often more cost effective to purchase gaskets in kits or pairs. You can purchase gaskets from variety channels or directly from us. We design and manufacture gaskets and engine sealing parts. We offer a wide variety of high quality sealing solutions, including gasket kits. Our offerings include both OEM and aftermarket parts, for a wide variety of applications. We welcome you to view our product lines and contact us with any questions. 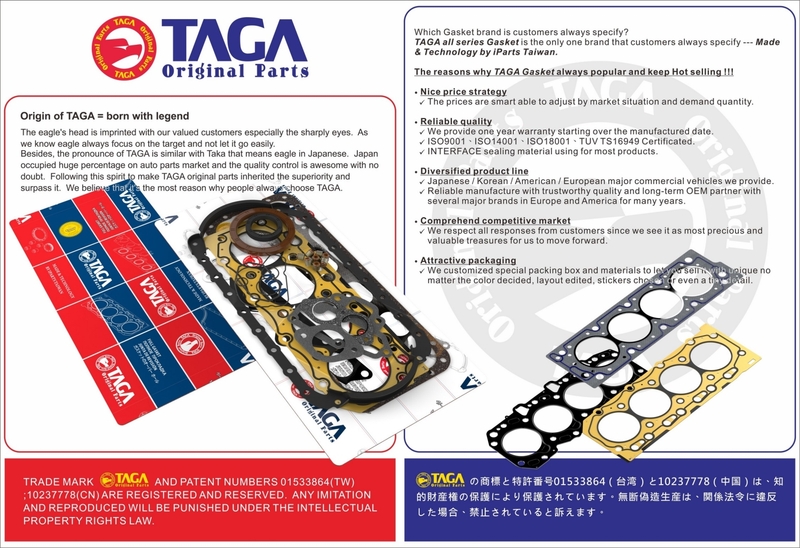 ◎MLS or Multiple Layers Steel – Most modern head engines are produced with MLS gaskets. These typically consist of three layers of steel. The contact faces are usually coated with a rubber-like coating such as Viton that adheres to the cylinder block and cylinder head while the thicker center layer is left bare. ◎Solid copper – a solid sheet of copper, and typically requires special machining called 'o-ringing' that places a piece of wire around the circumference of the cylinder to bite into the copper. When this is performed copper gaskets are extremely durable. Recently companies have started producing copper gaskets with integral sealing wires permitting their retrofit into engines without the removal of the engine block for machine work. ◎Composite – an older technology. Typically these are made from asbestos or graphite but are more prone to blowouts than newer gaskets. Asbestos gaskets are becoming increasingly rare due to health concerns. ◎Elastomeric – a gasket type used by Rover on their K Series engines. It utilised a steel core plate with molded in place silicone rubber beads to seal oil and coolant passages. The bores were sealed by rolled steel fire rings in a more conventional manner. The idea behind the gasket design was to produce a production version of the technology used in F1 engines at the time. The original application of the gasket on the smaller versions of the K Series was very successful. However, an engine redesign resulted in persistent problems with the design – the joint interface became unstable and the gasket could not cope. © IPARTS INTERNATIONAL LTD. (TAGA) All Rights Reserved.